Congratulations to Paul Grimshaw, June’s Employee of the Month! This is Paul’s third time to receive this great honor. He received the award during his first month on the job at Big Visual Group and then again in October of 2016. We think it’s safe to say that Paul is truly valued by his colleagues, who nominate and vote on this company-wide award! 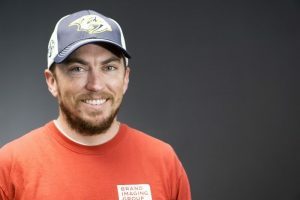 As for Paul’s favorite part of working at Big Visual Group, he says, “We always get to do something different.” Together, Paul and his coworker Brandon Gray (a previous Employee of the Month recipient) have been given the opportunity to do everything from unique vehicle wraps to NHL and CMA Festival signage. Paul says the variety of tasks are a good way to keep things fresh and not get bored. “I think everybody needs a change of pace to keep things interesting. It also gives you more experience in different aspects of the industry,” Paul affirms. Paul gives much credit to Brandon, attributing much of his onsite training to Brandon’s expertise. When asked why he believes Big Visual Group is the best signage company in town, Paul can’t say enough good things about the quality of his team’s work and the solid leadership of Scott Snoyer. “Scott has worked hard to build a solid reputation for this company. From ASD to production to design, everyone tries as hard as they can to do the best work possible,” Paul says. Paul also believes that Big Visual Group sets itself apart because of the company’s efforts to always go the extra mile in giving customers what they want.